Member: Jesus calls you to join him in his mission to make the world a better place. He will share with you his power over evil, sin, and death. More, he will give you peace and a home in his unlimited forgiveness and his unlimited love for you. Still more, he will guide you and continue to empower the rest of your life. Are you ready to pray with me? 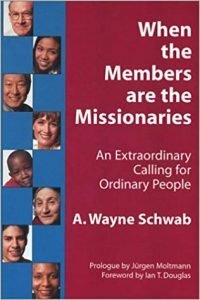 Member: Say with me: Jesus, I give myself to you to be part of your mission. Walk with me and fill me with your Spirit. Amen. Member: To follow Jesus is to be one of his people, the church. We come to worship on Sunday – and to all the church does – to live better on Monday. The word read and preached and taught and prayed about guides us. The Lord’s Supper reminds us that Jesus is present to help and to empower us every moment. So, let’s be in church Sunday with the other missionaries, our Christian sisters and brothers, to seal this prayer in baptism / in reaffirming your baptism and joining Jesus’ mission.